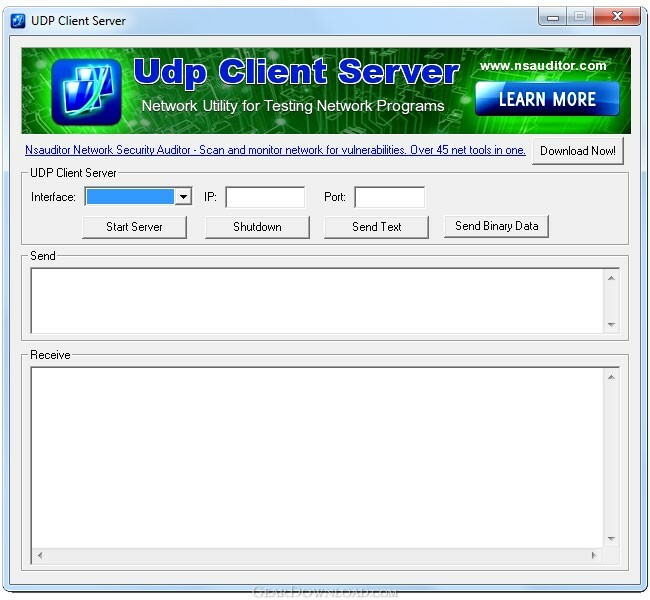 Udp Client Server - Udp Client Sever is a useful network utility for testing network programs. Udp Client Sever is a useful network utility for testing network programs, network services, firewalls and intrusion detection systems. Udp Client Sever can also be used for debugging network programs and configuring other network tools. The tool can work as a Udp client and Udp server, send and receive udp packets. The tool is designed with a user-friendly interface and is easy to use. This download (UdpClientServer.exe) was tested thoroughly and was found 100% clean. Click "Report Spyware" link on the top if you found this software contains any form of malware, including but not limited to: spyware, viruses, trojans and backdoors. TCP Port Forwarding 1.1.4 - Tcp Port Forwarding tool allows to capture and redirect TCP traffic. Tcp Client Server 1.1.6 - Tcp Client Sever is a useful network utility for testing network programs. TraceAlarm 1.0 - Continuous watching and monitoring of any changes of route to the remote host. NetInfo 8.3 - Scan your network, diagnose problem, and start troubleshooting. Bopup Scanner 2.1.9 - Freeware LAN scanner that resolves NetBIOS, MAC, IP addresses, HTTP servers. Speed Test Gold 1.0.736 - Speed Test your Internet and network while monitoring system performance.